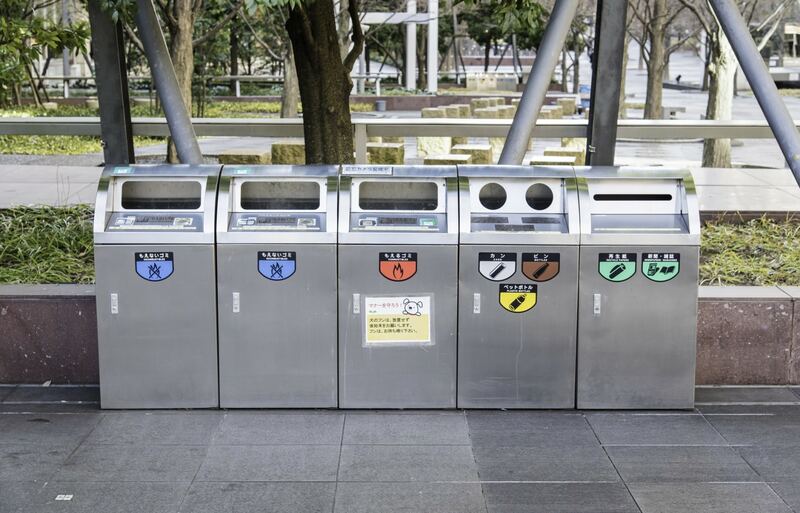 As a small island nation with limited space, Japan has a very precise system for sorting and disposing of garbage and recyclables. While these rules can be confusing on their own, the addition of a language barrier and regional rule variations can make it even more difficult to parse if you're new to the country. But we're here to help! The first step in properly sorting your garbage—called gomi (ゴミ) in Japanese—is to understand the different categories into which Japan splits it. They're relatively straightforward, but it's still important to know. 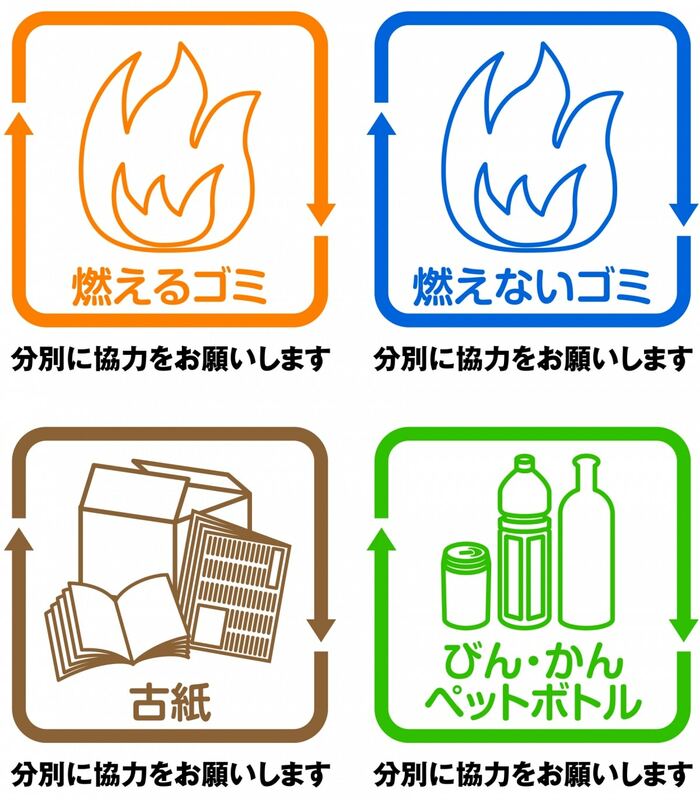 ・Burnable Garbage: Called moeru (燃える）gomi in Japanese, burnable garbage is exactly what it sounds like; things like soiled paper, food waste and food containers (take out boxes, yogurt containers, etc.) plastic bags (though those can often be recycled at local grocery stores) and the like. Burnable garbage is typically collected twice a week. ・Non-Burnable Garbage: Called moenai (燃えない) gomi, this covers small appliances or ceramic ware, metals, glass and other household items. Non-burnable garbage is collected much more infrequently, typically only once a month. ・Plastics: Also called purasuchikku (プラスチック・or pura for short), this category is important because Japan is notorious in its overuse of plastic. It covers non-soiled food containers, plastic wrapping or packaging, bottle caps and such. Plastics are usually collected once a week. ・Petroleum/Glass Bottles & Cans: Referred to as bin, kan and petto botoru (びん・かん・ペットボトル) respectively, these three items are typically collected together once a week. This category also sometimes includes clean metal cans. ・Old Paper: Or koshi (古紙), this category includes non-soiled paper products like cardboard and magazines. Old paper is usually collected weekly or bi-weekly. There's one more type of garbage that's especially important, but we'll get to that in a minute. In general, most things can be divided into these five categories. Now that you know the types of garbage, the first thing to do is find out the local rules for where you live. Each ward or district in Japan will have specific rules as to what you can throw away as burnable or recyclable, and set days of the week or month that each type of garbage is collected. You can pick up a leaflet at your local ward office, and you'll usually receive a Japanese one when you move into a new place. Ward offices even in the smallest towns now also have the information in various languages, including English. Some are incredibly detailed—see this example from the city of Osaka. Be sure to follow the schedule! It's pretty common for garbage collectors to look through the rubbish and leave behind items that aren't scheduled to be collected that day. Unlike the U.S. and other countries, garbage isn't collected from each house, but from a communal collection area. This may sound simple enough but depending on where you live, you may find that the collection area is not right outside your apartment. Be sure to find out where you need to take your garbage out to. The scheduling is especially important if the rubbish is to be left out in the open so be sure to find out the information and only take the rubbish out in the morning of each specified day of the week. If you have a lockable garbage area to which you have a key, you may get away with throwing rubbish out when necessary, but it is inadvisable. Burnable and recyclable garbage is usually collected on different days of the week. That means it's important to identify the type and location of your garbage collection area. They can range from entire rooms with dumpsters for each type of garbage in large apartment complexes to inconspicuous parts of a sidewalk or street, with a net to keep out crows and other scavengers. That's also why following the schedule is so important. Since garbage collectors usually only pick up the type of garbage specified for that day, you could end up making a mess for the rest of the community. If you have a garbage container that has to be accessed with a key, you might be able to get away with throwing rubbish out when necessary, but it's inadvisable. Even then space is limited, and if you're caught you might create unnecessary tension with your neighbors. The majority of smaller towns and villages will also require you to purchase official garbage bags. Each bag is identified by a color which determines what type of garbage can go into the bag. The money spent on the bags is used to help pay for the garbage collection provided by the town. These bags can usually be found in local supermarkets, drugstores and DIY stores in the area. Larger cities such as Osaka and Tokyo typically don't require specific bags, and any standard garbage bag will suffice. The best way to ensure you don't make a mistake with your garbage is to set up separate bins according to the information supplied by your ward office. This way, you can throw out the bag on collection day without any fuss. Purchase separate bins from your closest DIY or home goods store and label them clearly with the type of garbage and the collection date. Utilize your space efficiently by purchasing stackable receptacles, or smaller containers for garbage you won't have to throw away as much. We mentioned another type of garbage, and here it is! Bulky items and domestic appliances—called sodai gomi (粗大ごみ)—isn't collected regularly, and has to be arranged by contacting your ward office. Once a reservation has been made by the ward office, you will need to go to a nearby convenience store and purchase a sodai gomi shori tesuryo ken (粗大ごみ処理手数料券), which is a ticket to prove you have paid for the collection service—as well as a mouthful to say!—that you affix to the item you'd like to throw away. Then simply place the item in the designated location (typically your normal garbage collection area, though it can be in a different place) before the assigned time on the day of collection. Each ward office should have details on how to follow the procedures specific to their area. Here is an example of one in Osaka written in English. Typically ward offices are able to collect domestic appliances alongside oversized garbage, but there are some wards that don't have the resources to do so. In those cases you'll need to call the manufacturer and organize a collection for the item to be recycled. All Japanese manufacturers are required to offer this service but they set their own prices for doing so. Information on who to contact is usually provided when you purchase the item. It's also worth noting that many shops and sites like Amazon will offer to take old appliances away when they deliver your new one, for a fee. If you have items in good condition, another way of disposing things you don't need is to visit a recycle shop. You will get a very small amount back for giving your items to the shop, but you can avoid paying the charges for disposing bulky items or recycling domestic appliances. Please note that recycle shops typically won't accept items that require consumer assembly, so if you want to avoid paying to get rid of items from places like Ikea, you'll have to find someone to take it off your hands. This system might seem a bit confusing at first, but hopefully with this guide and a week or two in your area, you'll be able to sort and toss your garbage by instinct. Good luck!